A very stylish fellow! - Fashion For Lunch. It’s a very rainy weekend here in London, but I couldn’t resist posting these photos of my chap dressed stylishly for the wind and rain! Today we took a stroll round Brick lane market, had a cocktail in Dishoom, bought cakes from Kooky Bakes which are the best cakes/slices/whoopy pies in the whole of London, and went for lunch at Meat Mission, more on that later! 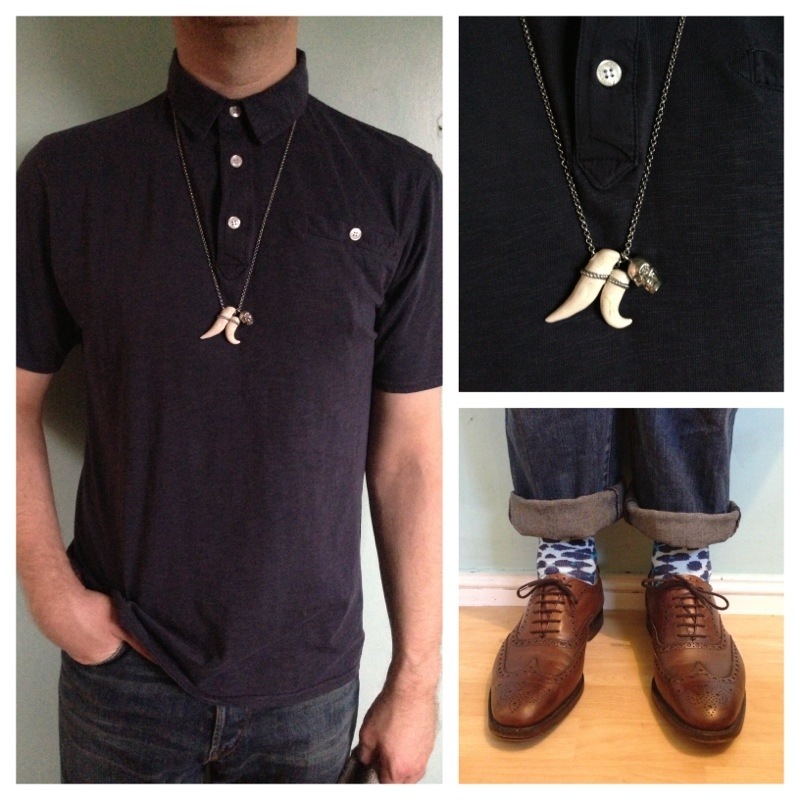 We dressed for the weather and my boyfriend definitely won in the style stakes today… Here’s what he wore. His tee shirt is by Peaceful Hooligan, it’s a great shape and great quality top. 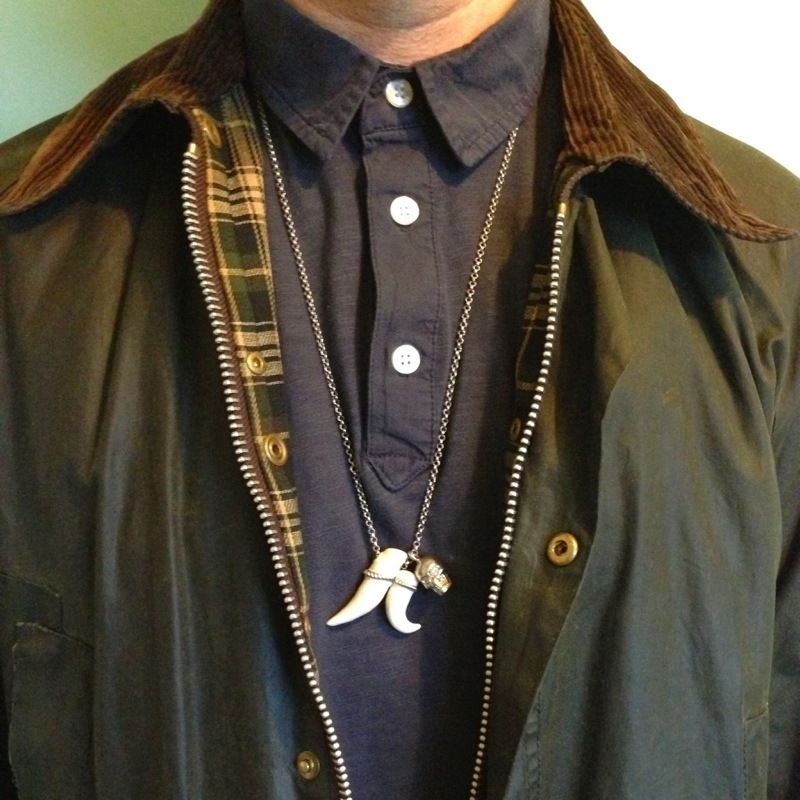 His necklace is by Alexander McQueen and his jeans are by Paul Smith. His snazzy socks are by Happy Socks and his shoes are the wonderfully British Church’s. The jacket in the second photo is by Barbour. Previous Post There ain’t no market like a French flea market! This will sound really odd, but one time, I was shopping in west fields (London….big mall…ring a bell?) and I bought the EXACT same socks! !, happy socks!!!!!! High five! Or is it foot five?!!! Anyway, believe it or not, but at this PRECISE moment in time, I’m actually wearing the socks!!! He looks like a London boy, impeccably dressed! Ok…please explain to me that lover part of the jeans? Don’t tell me it’s suppose to look like his is about to ride his bike?